An exhibition of Gordon Riker's final works will take place at Bodega in Boston. The show features prints, paintings, custom t-shirts and a 15 foot mural by Josh Falk, Kenji Nakayama and Mr. Never. 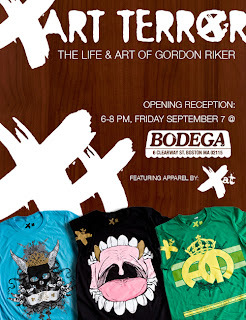 This show also marks the release of new t-shirt designs by Gordon's clothing label ART TERROR.